Snow in the Mega City. Traffic Chaos. Citizens were confused by cold white particles falling from the sky today. Eldsters quickly identified this freak phenomena as snow – something that hadn’t been see outside greetings vids for years. Traffic chaos ensued. A good use of a previous character and some dramatic action. Corrupt ex-Judge Rico Dredd, brother of Mega City’s top lawman Judge Joe Dredd, escaped Titan Penal Colony and returned to the Big Meg for revenge. After a shootout between the two brothers Rico was killed. The Grand Judge was on the scene and Dredd carried the body to the waiting ambulance himself. An awful cheezy line but a good story that expands the world and endows Dredd with genuine emotions. Anti-Robot hate group The Neon Knights kills again. Dredd took them down after his own robot, Walter, was robo-napped. Klan leader unmasked as cyborg. Unusual art style. Thick blacks and minimal background detail. Good racism analogy and very nice twist at the end. Well this is quite fun. Reading the early Dredd, reviving half-remembered stories and seeing all the seeds of Mega City One slowly germinating. Trouble is I have got a year to cover two-thousand stories. Reading wise it only takes me a minute or two per Prog but it takes me about twenty or thirty minutes to pump out my literary criticism, track down some art (or fail to track down art), and make it all look pretty. I love doing it but I also love eating and sleeping and I would have to give them up if I wanted carry on this in-depth coverage. There are good summaries of the early issues, then follow the link to his new site for the current 2000AD issues. So rather than compete I am going to try something different. For each storyline I will produce a headline in the style of a Mega City news report. And for the art, because you’ve gotta have art, I will put up the book I read it in so you can go find it yourself. I might put up the 2000AD cover if it is relevant instead. And for big stories you may get a full on review. Hey it’s not like anyone reads this anyway! 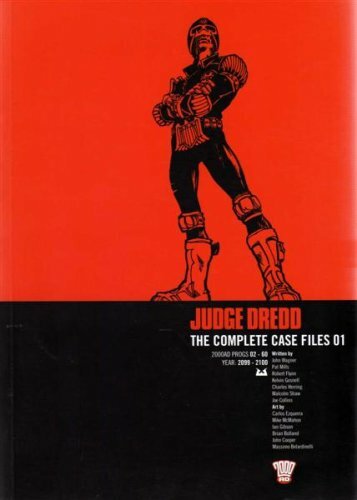 Plot: A rookie Judge passing out gets Dredd for his final assessment. Verdict: A really good story. We learn a lot about the Judges and the two issues are just enough to cram in a bit of drama, a bit of characterisation and some excitement. There is a slight crossover between Harlem Heroes, another story that also appeared in 2000AD, as the rookie Judge is the son of one of the Heroes. 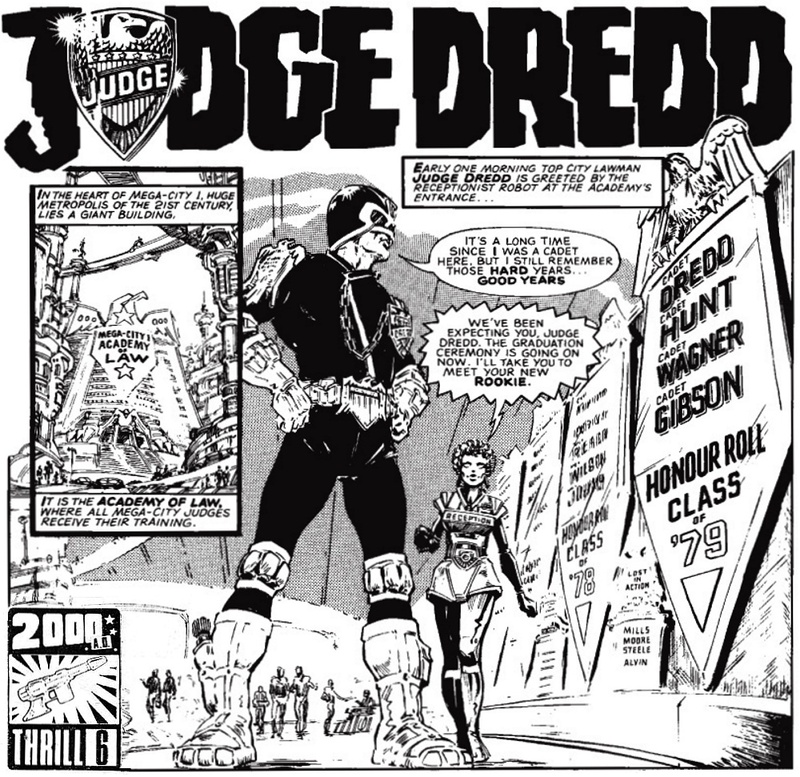 Another touch is the list of graduating Judges named after 2000AD writers and there is even a memorial to Judge Alvin – the first judge to ever die in a Judge Dredd Story in Prog 2. In typical Dredd fashion we learn that cadet judges train with live ammunition so they can get shot and expelled on the same day as there is no room for careless Judges. We have now left the wonderfully innovative and chaotic layout of the early strips in favour of squarer panels. The art is still good and portrays the action very well.